New Mesh. Octagonal post with column. 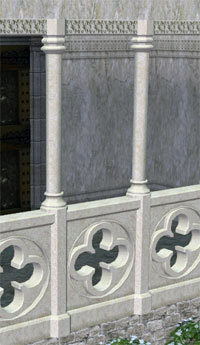 Matching my previous Medieval Gothic columns. New Mesh. Octagonal post. 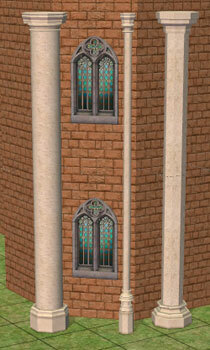 Matching my previous Medieval Gothic columns. These 3 story columns have the same shape and textures as the 1 story ones. Column 3, Column 2 and Column 1. New Mesh. These 2 story columns have the same shape and textures as the 1 story ones. Column 2, Column 3 and Column 1. New Mesh. 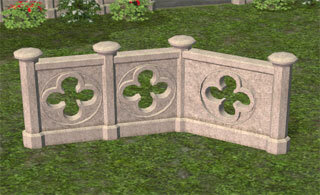 Round center pillar. Single Story column. Those thin columns are usually placed in a group of 4. Making a new mesh object with the 4 columns would result on a high poly mesh. However you can use the game cheats: "move objects on" and "boolprop snapobjectstogrid false" to place 4 columns as shown in the pic.